The UN General Assembly voted Friday to give Libya's seat in the world body to the National Transitional Council, which is expected to form the oil-rich North African country's next government. The vote means that a senior council official will be able to join world leaders and speak for Libya at next week's ministerial session of the General Assembly, and participate in meetings. Also Friday, the UN approved a new mission in Libya and the unfreezing of assets of two major oil companies. It also lifted a ban on flights by Libyan aircraft and modified an arms embargo. The diplomatic and political moves came as troops loyal to deposed dictator Moammar Gadhafi forced Libyan revolutionary forces into retreat from Bani Walid, one of the few remaining cities controlled by the ousted leader. Opposition soldiers also launched an attack against Gadhafi's hometown of Sirte and reported they had captured the airport. The tough defence of the holdout towns of Sirte and Bani Walid displayed the firepower and resolve of the Gadhafi followers and suggested Libya's new rulers may not easily break the back of regime holdouts. It also raised fears the country could face a protracted insurgency of the kind seen in Iraq and Afghanistan. Loyalist troops appeared to be heavily entrenched, however, almost four weeks after anti-Gadhafi forces stormed the capital Tripoli, and mounted a strong defence with mortars, snipers and rockets. 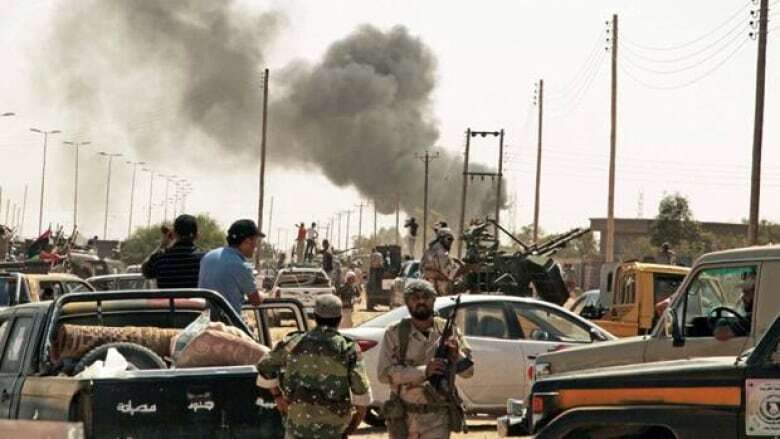 Libyan fighters in dozens of pickup trucks mounted with heavy weapons raced toward Bani Walid, 140 kilometres southeast of the capital Tripoli, earlier Friday. Explosions and gunfire resounded across the area and smoke billowed into the sky as troops exchanged fire. Cmdr. Abdullah Abu-Asara told The Associated Press that his forces were able to reach just over two kilometres away from the heart of Bani Walid. Revolutionary units, however, are now trying to regroup on the outskirts of the town. Fighting also erupted near the coast city of Sirte, Gadhafi's hometown, which reportedly contains hundreds of weapons caches. A multi-pronged assault from the east, west and south involving thousands of troops and several tanks was launched against the city Friday, according to a report from Al-Jazeera. These forces came under attack from rockets and snipers as they advanced toward Sirte. At least 11 revolutionary fighters have been killed and another 34 wounded, the news organization said. There were also reports anti-Gadhafi troops had taken the Sirte airport, located about 10 kilometres south of the city. NATO airstrikes continued to pound pro-Gadhafi targets. The alliance said it struck multiple rocket launchers, air missile systems, armoured vehicles and a military storage facility in Sirte on Thursday. NATO has conducted over 8,500 strikes on Libya since late March. The exact whereabouts of Gadhafi are unknown but the owner of a Syrian TV station who has been airing his recordings said the former leader is still in Libya. As the battles centred on Gadhafi holdouts Bani Walid, Sirte and the city of Sabha, located deep in the southern desert, Libya's interim leadership, the National Transitional Council, has been pushing forward with efforts to form a new government. The UN General Assembly voted Friday to give Libya's seat in the world body to the NTC. The vote means that a senior council official will be able to join world leaders and speak for Libya at next week's ministerial session of the General Assembly and also participate in meetings. On Thursday, British Prime Minister David Cameron and French President Nicolas Sarkozy expressed their support for the NTC, promising to release billions in frozen Libyan assets during a visit to Tripoli on Thursday. Turkey's Prime Minister Recep Tayyip Erdogan, meanwhile, was in the country Friday and met with Mustafa Abdul-Jalil, the head of the NTC. Erdogan was expected to discuss how to resume investments in Libya, where Turkish contractors were involved in 214 building projects worth more than $15 billion before the rebellion that ousted Gadhafi. He travelled to Libya as part of a tour of the Arab world, including Egypt and Tunisia, that is aimed at offering help for the countries and advancing his growing status as a regional leader. The U.S. government said Friday it was planning to take a more active role in securing thousands of rocket launchers, mines and small arms Gadhafi stockpiled during his four-decade rule. Washington is worried the weapons could fall into the hands of al-Qaeda or other extremist groups. Officials said the Obama administration is sending several additional weapons experts to Libya to help train local units to locate and destroy the equipment. The U.S. has two such contractors there already. The primary concern is an estimated 20,000 shoulder-launched missiles that could be used to shoot down helicopters or commercial airliners. The decision to increase weapons-related aid comes after U.S. officials received a request Friday from Libya's National Transitional Council for greater assistance in securing Gadhafi's former stocks of conventional weapons.